79 Foot Ditmar & Donaldson Passenger | Christian & Co. The vessel was inspected while afloat. Hull construction material is wood plank on frame. Deck is constructed wood and above deck structures are constructed of wood. Bulkheads are constructed of wood. Overall condition of the hull structure appears satisfactory. The vessel’s weight is unknown. Exterior rails and hardware appear satisfactory – good. Cosmetic condition of vessel appears satisfactory externally and satisfactory internally. Vessel’s external colors are white. Below waterline through hull fittings appear satisfactory. The vessel is equipped with one AC, one starboard engine driven and one electric / automatic bilge pumps that appear satisfactory and the bilge is holding moderate water. The ventilation system consists of two blowers and natural ventilation and appears satisfactory. General housekeeping appears good. Engines’ external surfaces appear satisfactory – good and exhibits no significant rust, oil or coolant leaks. Engine hour meters exhibit 11,770 and 11,773 hours. Motor mounts appear satisfactory – good. Cooling systems appear satisfactory – good. Fuel systems and components appear satisfactory – good. Exhaust systems and components appear satisfactory – good. Electrical system and components appear satisfactory – good. Engine control systems appear satisfactory – good and shaft logs appear satisfactory. Steering control systems appear satisfactory and rudder port appears satisfactory. Propulsion components were not inspected (vessel was not hauled). Generators’ surfaces and motor mounts appear satisfactory. Generators’ peripheral components and systems appear satisfactory. Port generator’s serial # CD4045004 (hard to read). Waste systems and components appear satisfactory. General service seawater systems appear satisfactory. There is 1,500 gallon capacity (approx.) in four steel tanks located outboard amidships and aft. Fuel tank surfaces were not visible and the securing mechanism appears good. The fuel fill, vent, feed and return lines and components appear satisfactory. Fuel shutoff valves are located at the manifold to port aft in engine room and appear satisfactory. The AC shore cord and connections appear satisfactory. The AC wiring and outlets appear satisfactory. The AC main feed are protected with circuit breakers. Battery arrangement appears satisfactory. Batteries are equipped with disconnect switches. DC wiring appears satisfactory. Circuit protection for the AC and DC branch system appears satisfactory. Wire terminations and connections appear satisfactory. Wire organization and arrangement appears satisfactory. Vessel has seven portable fire extinguishers with current certification. 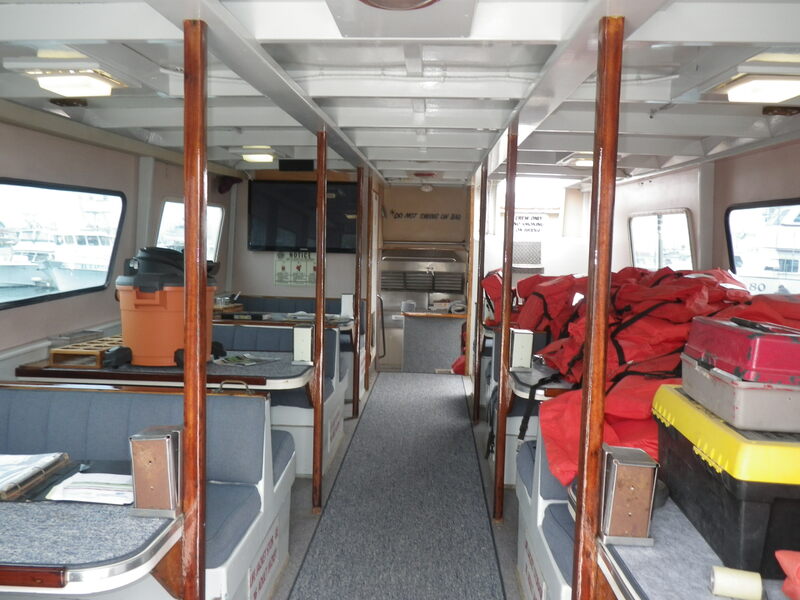 Vessel has an AC electric pump seawater fire fighting system with two stations, a CO2 – (5/14) unit in the engine room and an Ansu / R-102 fixed fire suppression system in the galley. The safety components include: twenty child type I and seventy six adult type PFDs, one life ring with strobe and three life ring throwable PFDs; distress flares with current certification; four life floats with four MOB strobe lights; suitable first aid kit; 110 lb. claw anchor with chain and rode that appears satisfactory. Navigational and anchor lights appear satisfactory. Other safety equipment includes: a high water alarm, 406 MHz EPIRB with current battery and hydrostatic release. The vessel was inspected at its normal slip location. Line condition and arrangement appears good. Boarding hazards appear insignificant. All entry points are reportedly kept locked. The vessel is a wooden plank on frame passenger fishing vessel equipped with two diesel engines and two diesel generators. The current owner purchased the vessel from his father in 2005. His father operated the vessel since the 1980’s. The current owner re-powered the vessel in 2006 with new engines, one new generator and the transmissions were rebuilt. The vessel was inspected while afloat, no sea trial was performed and the vessel was not hauled for survey. The vessel has a Certificate of Inspection (COI) for 49 passengers. The vessel appears basically structurally and mechanically sound. The vessel appears actively and well maintained. The vessel is well suited as a passenger carrying fishing vessel. The above were valued between $400,000 and $600,000. Also considered were the reported sales prices of the vessels “Freedom” and “Liberty” of approximate similar value. A vessel in this industry is usually sold with its book of business and its relationship with the sportfishing landing, the value below does not include the value of the business. The actual cash value is the value that our research approximates the selling price of this vessel should be, at the time and place of our inspection. The actual cash value is best determined by a thorough market search to determine what vessels are available on the market, followed by negotiations between the interested parties. Consideration is given to vessel’s condition, geographic location, published listings and guides, comparable sales and listings, and market conditions. This survey is for the express purpose of financing. It is not meant as a buyer’s survey.